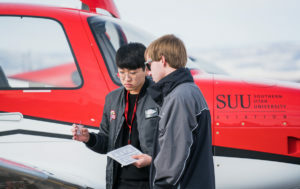 A collaboration between the Iron County School District, Southwest Technical College, Southern Utah University, and MSC Aerospace will provide a Stackable Credential Pathway for students to quickly move into the high-paying aerospace and manufacturing industry. During the 2018 Utah Legislative Session in Salt Lake City, the legislature granted the request for the Strategic Workforce Initiative funding presented by the Higher Education Appropriations Subcommittee. This request will extend the current Utah Aerospace Pathway program. This effort will provide the opportunity for stackable credentials with multiple entry and exit points to support multiple academic paths.